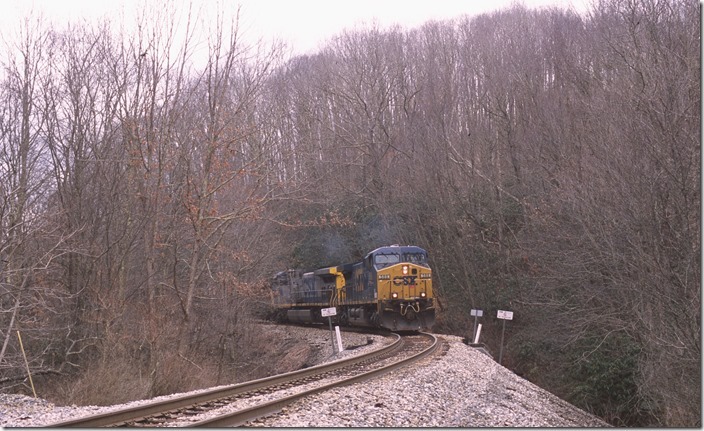 On Friday, March 28, Bob Jackson, Ron Piskor and I departed from the Hawks Nest State Park lodge at Ansted in search of rail activity on the former Nicholas, Fayette & Greenbrier Railroad, now simply CSX. We were in attendance of the annual Hawks Nest Modeler’s Weekend held at the lodge. 1. 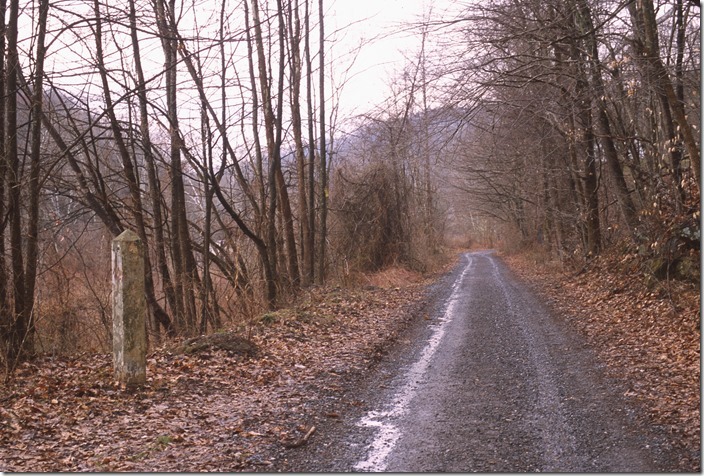 First we drive drove up the hollow at Ansted to explore the abandoned roadbed of C&O’s Ansted Branch. 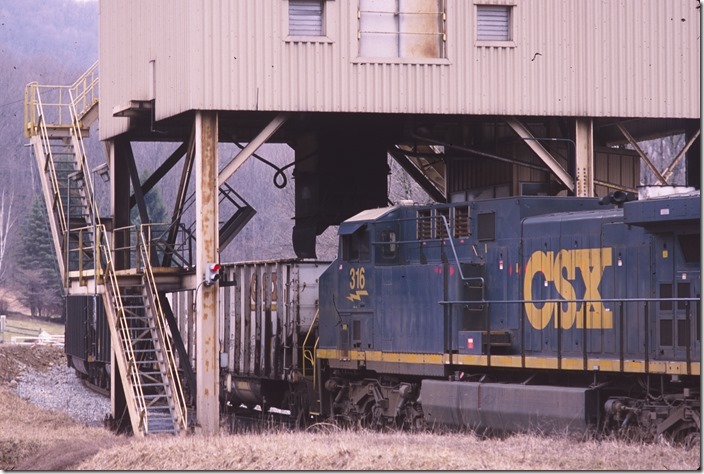 An excellent article in a recent C&O Historical Magazine discussed this branch and its mines. 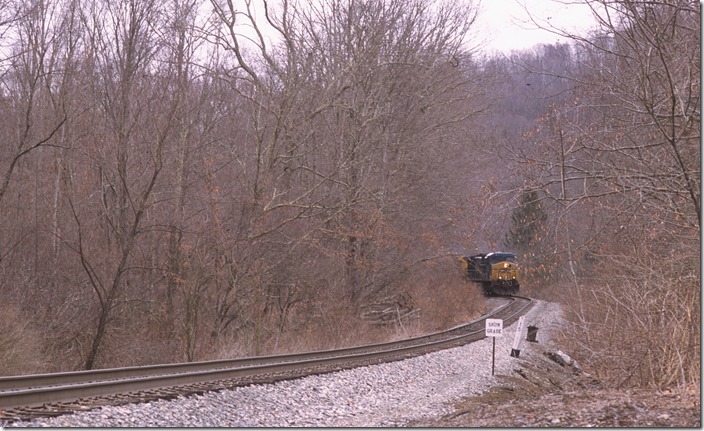 This photo – taken near the switchback to the mines of Gauley Mountain Coal Co. – shows C&O milepost 3 on the left. The view is looking back toward US 60. 2. 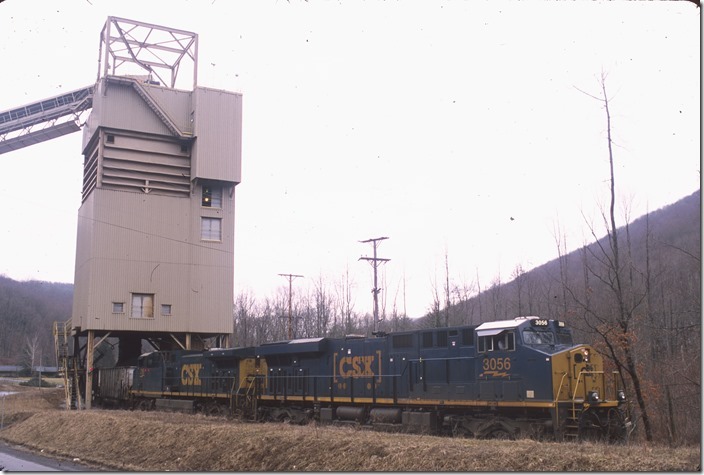 On the e found shifter H800-27 backing up the Rupert SD at Gumm Siding to the mine load-out. 3. 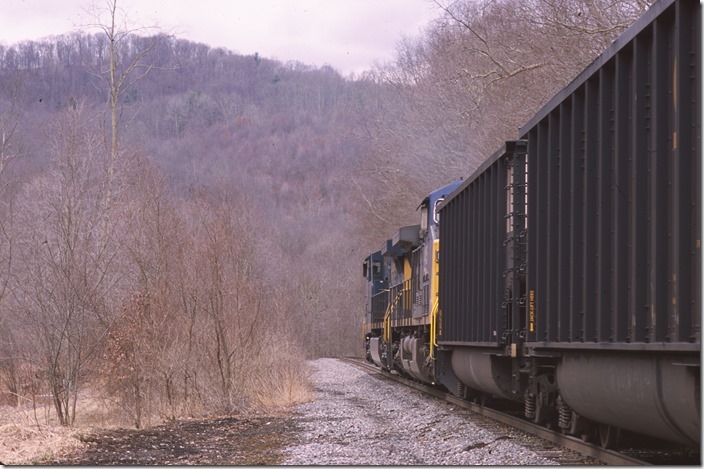 “Spotting up” at Greenbrier Smokeless Coal near Anjean. 4. 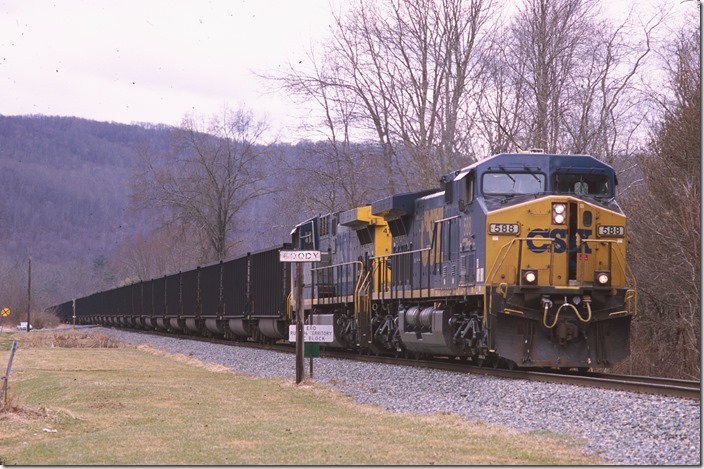 Coal starts to flow into the first of the 75 cars H800-27 needs to fill this day. 5. 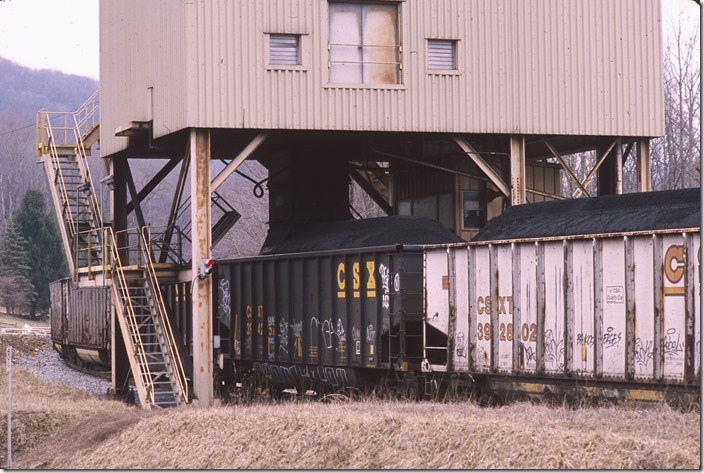 Coal starts to flow into the first of the 75 cars H800-27 needs to fill this day. View 2. As this process will take a while and the engineer has told us that another crew is bringing empties up from Meadow Creek, we departed the scene and headed toward Meadow Creek. Near Top Siding we met shifter H800-28 bringing 75 more empties up the steep grade. 6. 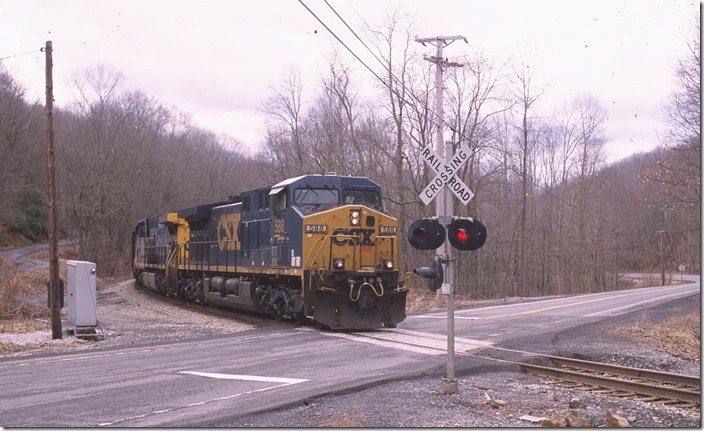 Crossing WV 20 at Top Siding. 7. 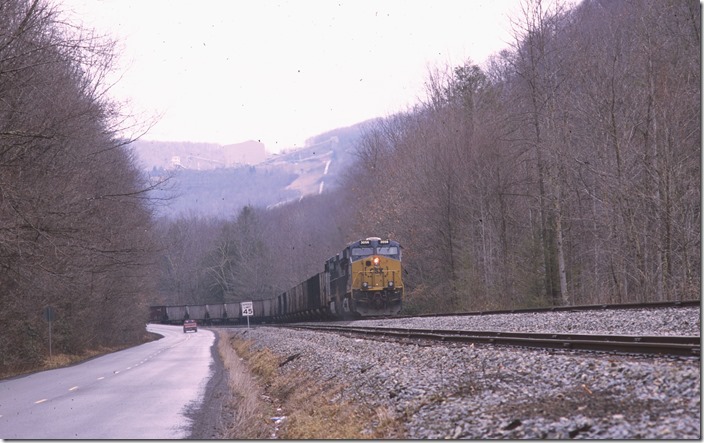 Going down the mountain and crossing WV 20 again below Springdale. 8. Dropping off the steepest part of the grade at Bellwood. 9. Dropping off the steepest part of the grade at Bellwood. View 2. 109. Dropping off the steepest part of the grade at Bellwood. View 3. 11. 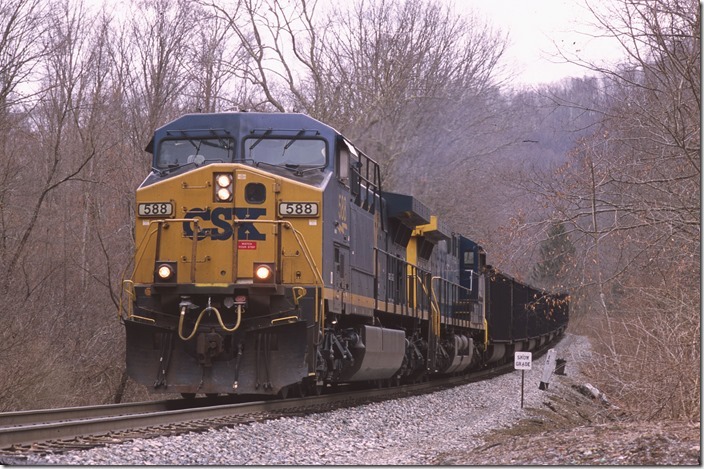 CSX 588-415 approach Rainelle at “Woody”. H800-28 stops briefly at Rainelle, and we grab a bite to eat at Dairy Queen. More on the rest of the day later.